Palladium Hotel Group has successfully converted the former The Royal Suites Yucatan by Palladium and adjacent Grand Palladium Riviera Resort & Spa to introduce a new luxury oasis on Mexico's Caribbean coast. The adults-only TRS Yucatan Hotel is officially open in Riviera Maya with 454 renovated suites, a glut of a la carte restaurants, a signature beach club, multiple pools, a spa and wellness center, as well as the resort's new Infinite Indulgence concept designed to heighten the all-inclusive experience through enhanced premium services. The beachfront hotel's suites are spread out across 13 villas and boast terraces offering tremendous views, round-the-clock room service and private pools in some cases. Guests can savor French dishes at La Boheme, sample Italian cuisine at Tentazione or take their pick of freshly-cut meats at El Gaucho. Chic Cabaret & Restaurant offers a contemporary sit-down meal while gourmet cuisine awaits at Capricho. 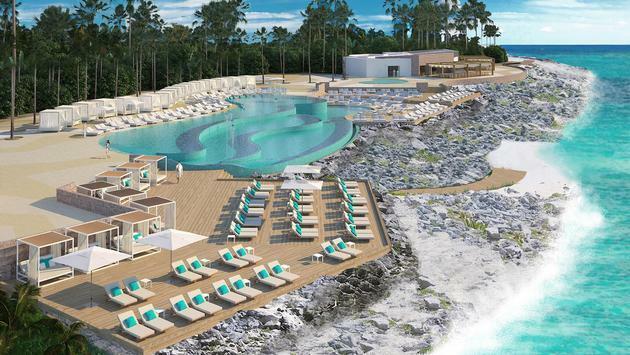 Oceanfront enhancements are highlighted by TRS Hotels' signature beach club. Guests can jam out to live music or take their taste buds on a journey with some authentic a la carte Mediterranean eats from Helios, the new beach club restaurant. Beach-goers can also sip on a cocktail or two from the lo beach bar after a rewarding snorkeling, kayaking or paddleboarding session. Two additional bars—Gaia and Aurum—await guests in the lobby and by the pool, respectively. The Helios Infinity Pool features multiple levels offering unique perspectives of the Caribbean Sea while the Las Rocas saltwater pool provides a solarium housing sunbeds, lounge chairs and Balinese beds. Those seeking to achieve total zen are sure to do so at the Zentropía Palladium Spa & Wellness center. The complimentary facility is a one-stop shop for facials and massages as well as steam rooms, sauna and whirlpool tubs. The wellness center also features a gym. "As the adult market in Mexico and the Caribbean continues to grow, Palladium Hotel Group seeks to make a difference through the evolution of its exclusive adults-only brand, TRS Hotels, and for this reason important renovations were executed at the Riviera Maya properties," Palladium Hotel Group's commercial director for North America, Jacques De Paep said in a statement. In addition to the newly-renovated TRS Yucatan Hotel, travelers to Mexico can look forward to the 2018 opening of the family-friendly Grand Palladium Costa Mujeres Resort & Spa, as well as the adults-only TRS Coral Hotel in the most northern point of Cancun. Elsewhere in Riviera Maya, the Grand Palladium Colonial Resort & Spa and the Grand Palladium Kantenah Resort & Spa stand out as premier family destinations.